The one with the plan is the one with the power. Most planning is done in preparation for an event. However, strategic, purposeful planning rarely ends. Each level of accomplishment leads to the next level. Continuous growth in line with your family’s Values, Vision and Goals calls for continuous planning. An organized process enables you to focus your efforts on what is important, and to be prepared for every outcome good or bad. Purposeful process positions you to adapt to change, manage new dangers, and capitalize on new opportunities. Purposeful process increases your likelihood of success. Plan – Evaluate your present situation and where you want to go. Then decide on your best-alternative path. Execute – Implement your plan. Establish clear benchmarks of progress. Measure your results. Adapt accordingly. Prosper – Celebrate attained goals. Enjoy your accomplishments. Renew your energy. Dream on. Repeat – Refresh your goals. Build upon your confidence. Restate your plan. Continue your growth. This simple process is the key to organized growth. It enables families to get on track and stay on track. 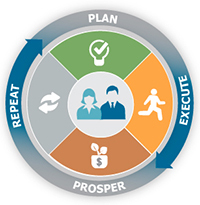 A well run strategic plan makes financial product selection easier. It makes performance more measurable and a successful outcome is more likely. It also minimizes risk and enhances peace of mind. Superior Planning provides unbiased advice and implementation services for a mutually agreed upon retainer. Unlike most financial advisors, there is never an obligation to buy or invest in any other financial product or service. Every family is unique, as is their place on their family wealth journey. Every family’s situation is different, as are their values, visions and goals. To meet the demands of these family-specific challenges, Superior Planning has developed an array of Plans and Programs. Designed to overcome the most common life event challenges, each can be tailored to meet the needs of the most complex family matters. One size does not fit all. Click on Getting Started for how to go about determining whether working together may be right for you and your family.